Everyone needs this book right now. SPRING is coming. 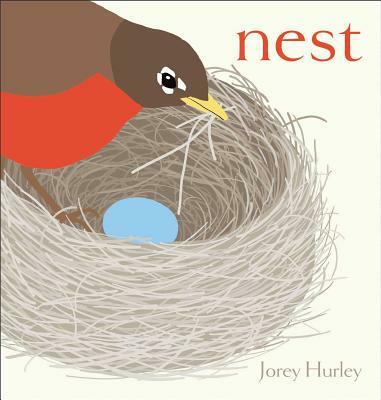 With simple, colorful illustrations and text, Jorey Hurley follows the life of a hatchling over the course of a year. Young children will enjoy learning the word that goes with each picture and imagining that there will be green leaves soon!! Adults will like that too!!!! Newcomer Hurley lets her bright, clean illustrations do her storytelling, limiting the text on each page to a single, evocative word. The first spread—“nest”—accompanies two robins guarding a precious blue egg. Like silk-screened images, Hurley’s digitally created artwork represents the birds and the trees they live in with flat, sharply delineated areas of color on matte pages; airy white space in the compositions duplicates the freedom in which the birds live and soar. Although the forms are stripped down, some small details are preserved, like the intricately woven twigs of the nest and the sparks of light in the birds’ eyes. “Grow” shows the robins bringing worms to their nestling amid a bower of blossoms; throughout, Hurley celebrates the changing seasons. Although it suggests itself as a bedtime book, the arc of the story is not day moving into night, and the page that says “sleep” is not the last one—with an “Awake,” the next spread shows the rising sun. Robins meet other robins and start again where they began: “Nest.” A handsome, disciplined debut. Ages 3–7. In this stunning debut, we meet a pair of robins and their egg. We watch the parents incubate and hatch the egg and teach the baby bird to survive and fly. Seasons change, colors change. The family faces danger, but ultimately finds safety and comfort. This story is told primarily through the crisp illustrations that have a light, airy quality. The narrative includes only fifteen words, one on each spread, which adds to the dramatic impact: “Nest…warm…hatch….grow…jump….” The conceptual space between each page turn invites readers to thread together the story and imagine each step in the bird’s journey. The illustrations evoke the eloquent simplicity of a Japanese woodblock print while the frontispiece depicts clusters of robin’s eggs, reminiscent of clouds in a Georgia O’Keefe painting. Every page resonates with a vision that is both ethereal and quotidian. The birds are depicted naturalistically and an author’s note includes factual information about robins and their nests. Nest’s beauty and originality will stand up to countless re-readings.